Before I even started the book, it quickly became apparent that this was THE novel of the moment. Right after our book club chose it, it made the short list for the Man Booker Prize. (Coincidence? We'll never know.) Many of my friends began posting to social media about how heartbroken the book had left them. I got added to a group on Facebook created purely to provide emotional support while reading. Every mention of the book on Twitter was accompanied by two emojis - broken heart and crying face. Things were getting serious. And so I started reading the book. It took me about 50 pages to really get into it. At first, I was confused. Who was black? Who was white? Who was gay? Who was straight? We're in New York City, but what time period does this take place? Who are all these friends that keep stopping by? Who is important? Soon, though, I settled down and settled in. For the most part, the book follows a core group of four men, recent college graduates who have just moved to New York City. As the book progresses, it becomes clear that one of these men, Jude, is the true main character, and bit by bit we learn about his history, the life he led before he came to college and met his three dearest friends. It was a life marked by all kinds of abuse, and it's a good thing we don't get the details all at once - they're hard to take, and a huge part of why this book is so ridiculously sad. But for a book that delves so deeply into tragedy and sadness, there are also moments of real happiness, which creates a gorgeous and complicated testament to love and friendship and our limits as human beings. 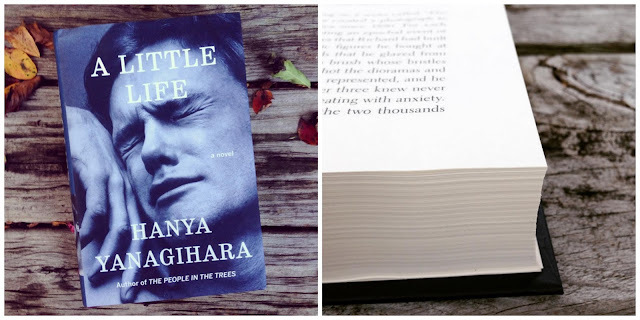 Since I finished the book, I've read a ton of interviews with Yanagihara, reviews of the book, and analyses of the characters, and I've seen it called everything from a rare view of male friendship to the Great Gay Novel to a dark fairytale. It is, of course, all these things, because a book - at least a great one - is never one thing, and this book is definitely great. I've read 27 books so far this year, and none of them has affected me as deeply or lingered as long in mind and heart as this one. You might notice that I'm not saying much about the actual plot of the book. There are so many twists and so much happens - the book follows the characters from their early 20s to their early 50s, which is a lot of life - and each reveal is so highly anticipated, so necessary and horrifying and such a gift, that I can't give any of them away. Instead, I will tell you this. I finished the last 200 or so pages of the book over the course of a few nights, alone in my house because Nathan was working late. I knew that even though things for the characters had been bad, they were soon going to get worse, so I approached each reading session with fear, trepidation, and a box of tissues. In between the hours I spent reading, I wandered through the world and went to work, but I was barely there. I couldn't stop thinking about the characters, Jude especially - they took over my life in the best way. At once point, while reading, I was so engrossed that I didn't see something very big coming. When The Thing arrived, I slammed the book shut and yelled, "No. NO. NO!" into my empty house. I finally finished the book in a two hour stretch during which I could not stop weeping - I had no idea I could produce so many tears. Maybe this is a strange sort of recommendation - "Read this book! You'll never be the same! It will break your heart into a thousand pieces!" - but you should know what you're getting into. Think of it as a doomed relationship, one you know will not end well, but will challenge you, force you to confront dark truths, and make you question everything you thought you knew about love, friendship, and loss. And when you're done, let me know. No matter how long it takes, I'll still be thinking about this book, and I'll always need to talk about it.